Though the change of seasons isn’t dramatic in the Bay Area, I’ve been noticing the familiar rustle of fallen leaves skipping across the sidewalks in the wind. It started a few weeks ago, just when I had begun hoping for it, and the tightness in my chest—from stress, from worry—relaxed at the familiar sound. I love fall, what with its warm soups and autumnal baked treats and thick sweaters and crunchy, colored leaves. But I also love the change, and how that change makes me feel. I want to be pushed into a new moment, to be forced out of one set routine into another, to see things anew when I assume I know the landscape. I’m not one who avoids change at all costs, nor one who truly thrives on it. I love the adventures and challenges that only come when life shifts, but I also get comfortable and cozy in the meantime. The most unwanted changes are generally out of our control—we lose jobs or opportunities, people we love pass away, we have to move when we had intended to stay. And many good changes are out of our hands, too. Yet change is also conscious, especially the sort that makes us grow and drives us toward our purpose, and it can be difficult to move toward it, especially when we’ve finally gotten the house tidy and have our slippers on. But the shifting seasons? They’re blissfully out of our control. And they remind us that we can handle change. Sometimes I’m not ready for what nature throws—Michigan’s blizzards, for example, or crisp fall winds when I wasn’t quite done with summer. But every time, I find goodness: remembering how lovely a fire feels when one is very, very cold, or how deliciously autumnal fruits pair with sweet pastry, or how enlivened I am by that which is new. This year, the change of seasons is mirrored by changes in my life. New work, new friendships, new challenges, new trials. Though some days I’m quite sure I could do without the trials, it is fitting for this to happen alongside the changing seasons, as if I, too, am following the trajectory of earth around sun. I know that if I push through, I’ll be abundantly glad. And those glowing moments of goodness will come—they always do. First, make the crust. Place the pepitas and almonds in a food processor. Pulse until the mixture is powdery but small pieces of seeds and nuts remain. Add the dates, coconut oil, cinnamon and salt. Process again, continuing until the mixture is sticky and beginning to hold together. Press the nut and seed mixture evenly into the tart pans. Place in the refrigerator to chill until needed, or up to a couple hours. Next, make the filling. In a medium bowl, mix the mascarpone, honey and vanilla with a spatula until evenly combined and thick. (Don’t use a mixer for these steps—you’re looking for a frosting-like consistency and appearance.) Gently fold in the heavy cream. Spread the mixture evenly into the prepared tart pans. 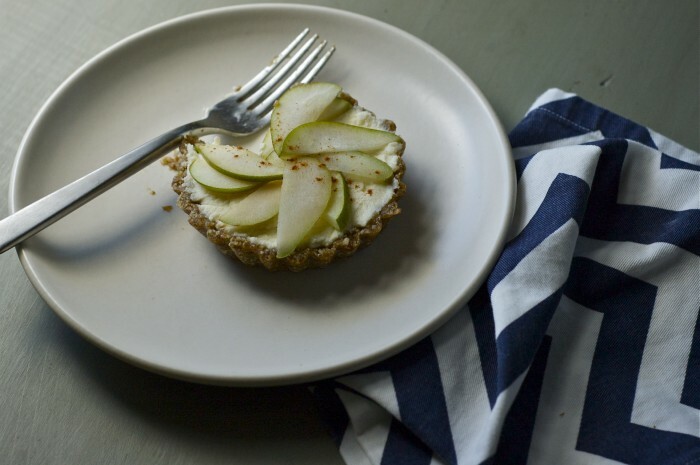 Decorate the tarts with the slices of pears. If desired, sprinkle with a bit of cinnamon. Chill until ready to serve. It’s funny the subtlety of fall here in the east bay. I swear some days I can smell it. It’s the fallen leaves and brisk mornings. Around sundown you really feel it though. Evening walks around lake Merritt or by the bay just don’t feel quite the same. Being from Minnesota I really miss a true fall, especially all of the beautifully colored leaves. But I’ve still found fall to be my favorite season here. 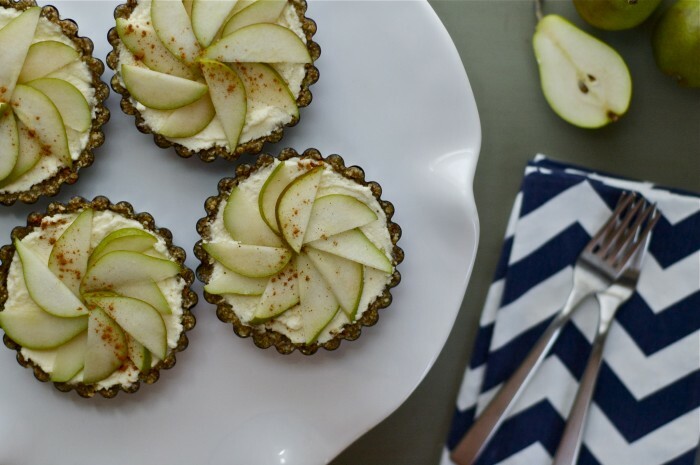 I’m fully embracing fall produce and these tarts are next on my list! This is such a lovely recipe! 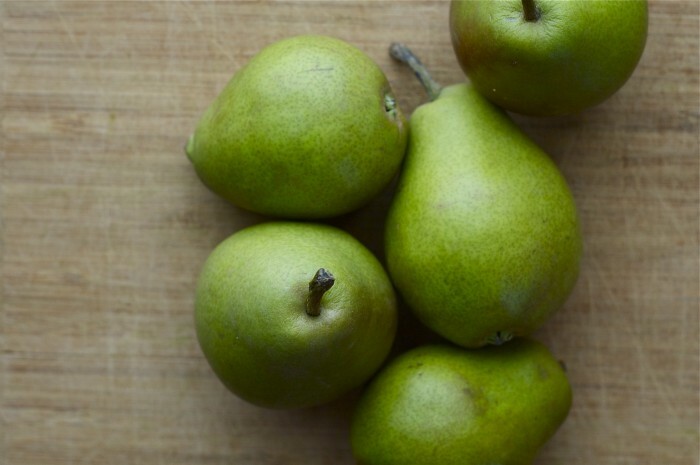 Pear is my favorite fruit, and they’re perfect in the fall. You’re right — the seasons are out of our control. I find fall to be a tough time, full of nostalgia for the summer. But this year, it’s so busy I hardly have time to process the changes. Thanks for sharing your own reflections! Hope the changes buoy you! The familiar rustle indeed. The shift from summer to autumn has always been and perhaps always will be my favourite of all seasonal transitions… it’s always incredible and humbling to look back year to year and remember how different our situations and perceptions were the previous summer/autumn and the one before that. It’s like double nostalgia on top of the inherently nostalgic season change! Lovely recipe. 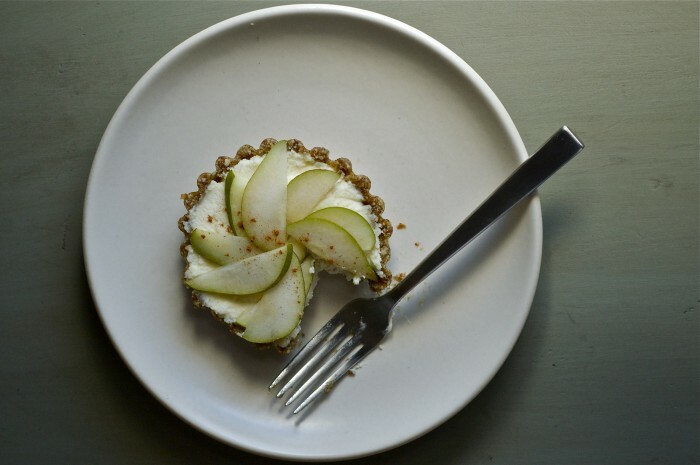 I’ve been meaning to try making a raw crust like this one. This recipe looks delicious. 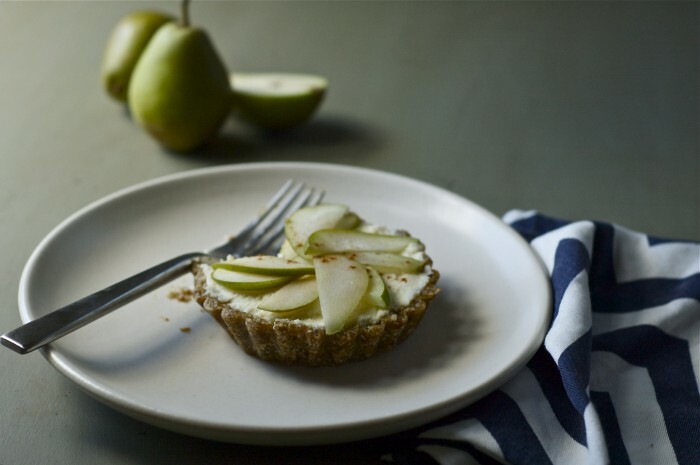 Pears are one of those fruits that i never think of using when baking. Next time I hit the supermarket, Pears will go in my basket. Thanks for such a great blog. Blissfully out of our control, indeed. I love that. It’s funny how every year I crave a big, dramatic, intense season change into fall, with grey skies and winds and shifting weather, but usually we have to find it hiding out, in those leaves scattering, in the changing light. I’m such a wimp when it comes to change but I love the way you talk about it here and about what the change in seasons represents – you’ve given me such a fresh and new perspective. Happy fall!